A photo posted on Facebook by irate Gudja councillor Mark Anthony Sammut showing a car rental company’s vehicle parked in a public car park. Residents insist the company is breaching the law when it allegedly leaves its cars there. Two Gudja councillors are up in arms over what they claim is an illegal occupation of public parking spots by a rental car company. In a stern letter to Transport Malta, councillors Mark Anthony Sammut and Stefan Caruana called on the authority to clamp down on the abuse. The letter, published by Mr Sammut on his Facebook page, is the result of pent-up frustration in the wake of what the councillor described as non-action by the police and the national warden agency. 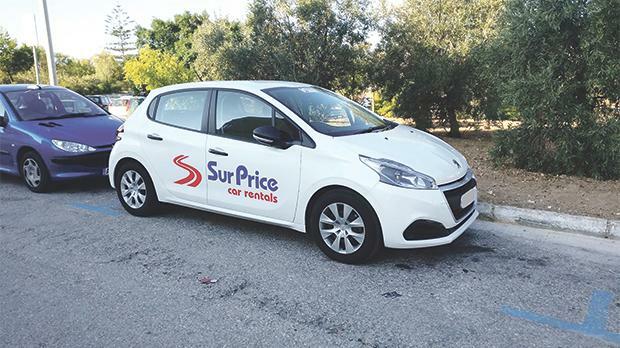 Mr Sammut told the Times of Malta the rental car company SurPrice was leaving its cars parked in a public car park on the village outskirts in breach of the law regulating rental companies. “There were occasions when the company had 15 or more cars parked there, some were also left overnight and company employees could also be seen washing the rental vehicles,” Mr Sammut said. However, SurPrice managing director Manuel Camilleri denied using the public car park to ‘garage’ the cars. He insisted the rental cars were kept at his premises in Żebbuġ. When it was pointed out that photos published on Facebook showed cars with his company’s logo on them, Mr Camilleri said they could have been cars used by his employees while on duty. “Tourists pick up the car they would have booked from the drop off/pick up zone at Malta International Airport after we drive it over from Żebbuġ at the agreed time,” Mr Camilleri insisted, adding there was no available space at the MIA car park designated for rental car companies. He threatened to sue the councillors for defamation, insisting that with between 30 and 50 bookings a day, his company would block the public car park if it were to use it to park its vehicles. “The cars that have been photographed may have been used by my employees and until 4pm anyone can park in the area,” Mr Camilleri said. The car park has blue boxes that are designated for Gudja residents only after 4pm. However the legal notice covering this matter never entered into force after applications for new resident parking schemes were suspended a few years ago. Mr Sammut said the “illegal use” of the public car park was flagged more than a month ago and although on one occasion the cars were removed after the police moved in, calls for further action fell on deaf ears. He said Transport Malta yesterday acknowledged receipt of the letter and promised to look into the matter. The licensing of car hire companies is regulated by TM. Legal Notice 88 of 2010 stipulates that authorisation to operate a vehicle hire service has to be given by the transport watchdog. It also includes conditions the company has to fulfil to be able to operate a car hire service. The car hire company has to provide proof that it is in possession of a premises, approved by the Planning Authority, where every motor vehicle registered and licensed in the name of the operator has to be garaged “while not hired or leased out”.